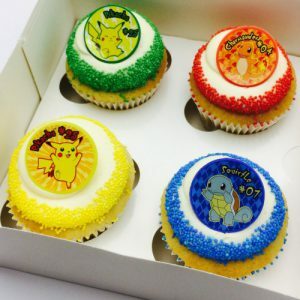 Super fun and colorful box of Pokemon themed cupcakes, decorated with matching sprinkles and a plastic (non-edible) ring. Great for birthday parties! When choosing Vegan, we will only add the decoration rings, no sprinkles. SKU: N/A. Categories: THEMED CUPCAKES, VEGAN OPTIONS.